So the next step in the process is to add what you or I might call “the keel” (but the designer calls the “the deadwood“). I imagined this would be an easy job, but it actually transpired to be quite taxing and turned into some nightmarish version of steel and wood Lego, where determining the exact order of events for the build bore dire consequences and was fraught with issues – I think we are nearly there now, but let this be a salutatory tail of the importance of obeying that #1 maker’s rule of “measure twice and cut once!”. The general idea is that you cut and fit “lifts” (lengths of roughly square timber) to the hull at the “hog” and then stack more on top to make a roughly triangular keel growing from nothing at the bow to a height sufficient to guard the propeller at the stern (and provide a lower mounting pintle for the rudder). These lifts are all epoxied together and secured to the hull/hog with about sixteen 12mm stainless steel bolts. This is complexified by the fact that the propeller shaft (and its enclosing stern-tube) pass through this construction, meaning that some of the bolts at the stern can’t go all the way thru and have to be replaced by pairs of bolts, one securing the lower part of the deadwood to the hull and the other tying the lifts of the upper part of the deadwood into a solid lump. 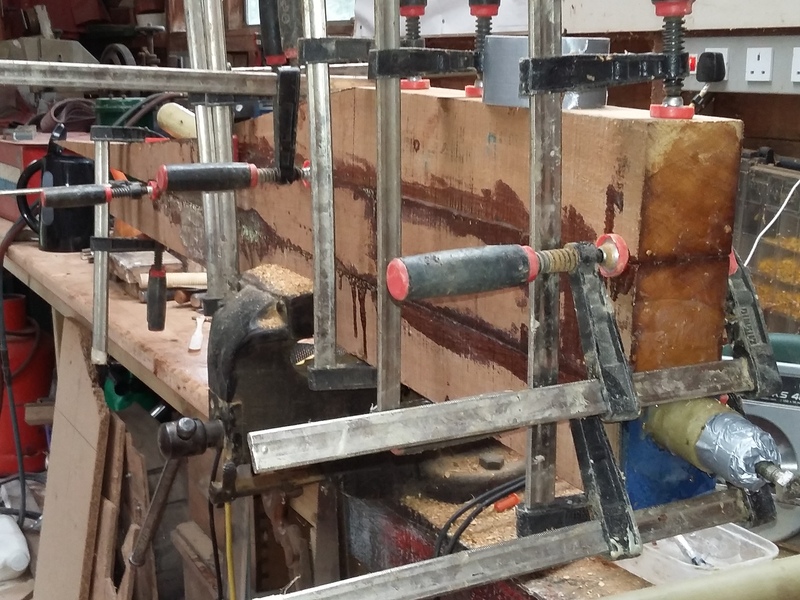 The first bit is fitting the “square” baulks of timber to the distinctly curvy hull. Once shown the trick of this it’s really simple – you arrange you timber so it is horizontal and sitting on the hull, and then “spill” a line onto this showing how it needs to be shaped to fit. This just involves taping a carpenter’s pencil (or “Sharpie” in my case) to a small block of wood (a “spilling block”) held vertically against the hull, so that at the lowest point of the hull the pen is against the lower edge of the wood – then just slide the spilling block along (keeping it vertical and the pen will trace out the shape of the hull onto the “lift” showing you where it needs to be cut/planed/sanded/sawed/chiseled to to fit – and low-&-behold it damn well works!! Then we needed to arrange for the stern tube to go thru the timbers we were fitting… now a bit of inspection showed that this would mean a 4-foot length of 1¾ inch glass-fibre stern tube being fitted thru a stack of four 3-inch square lifts – drilling a 4-foot long 1¾ inch hole in something as tough as oak so that it was straight and lined up with the hole in the hull was patently NEEEVVEERR going to work – so the preferred game plan was to cut “half the hole” into each of two of the lifts before they are glued together and then assemble them. That might of been simple if the alignment of the propeller shaft was the same as the joints in the wood – but it was not, so we had a sort of mental jig-saw to construct by cutting bits out of the middle of three of the lifts so that when they were assembled you were left with a hole the stern-tube would fit into and be properly aligned…. that sentence turned into a lot of work. 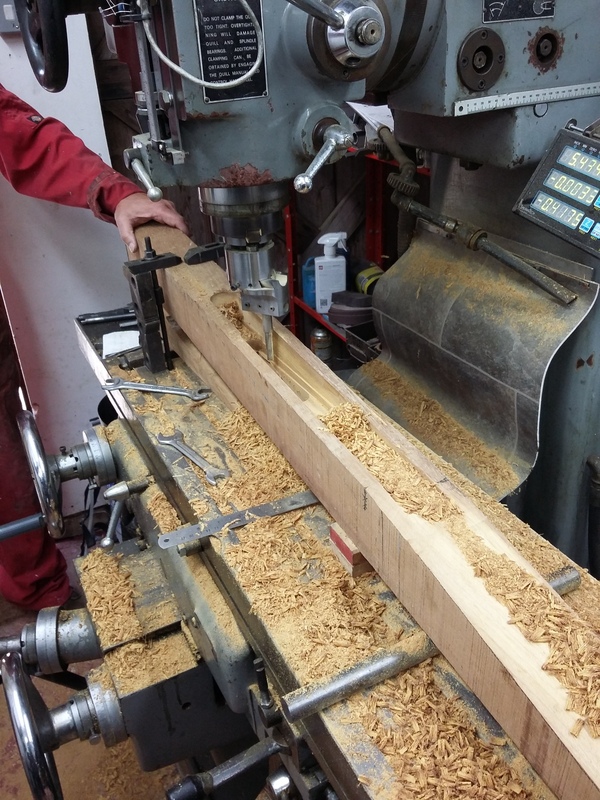 We decided to make the job a bit more “accurate and precise” by milling the slots into the lifts – as the picture below shows…. As you can see we actually did this by inserting a long-series slot-drill into the boring head and using the self-act feed to cut the “u”-shaped slot (and arranging the lift at the right angle to the horizontal so as to cut the depth of the slot to match the tube’s intended angle, simples! We also approximated a “half-circle” by adjusting the width of the slot as we cut deeper. This was a bit mind-bending, and we realized we had cut more than needed in some places and less in others, but the epoxy and filler is great at filling gaps and is actually stronger than the timber! (if somewhat expensive! ), and elbow grease, files, chisels and flap-wheels remove the excess. Then we epoxied the lifts together with the tube in place and “hey presto” the job was done….Actually of course this took a bit longer than described here, and involved a lot of head-scratching and some amount of swearing… One result of having to fill some quite large voids is that being as how the curing of the epoxy is an exo-thermal reaction if you put a lot of epoxy in one place (and then insulate it well with wood) it gets VERY hot – Nigel had forewarned me of this, so I actually filled the stern tube with water to dissipate some of the heat (and emptied and refilled it when it started steaming!!!). More pictures below. 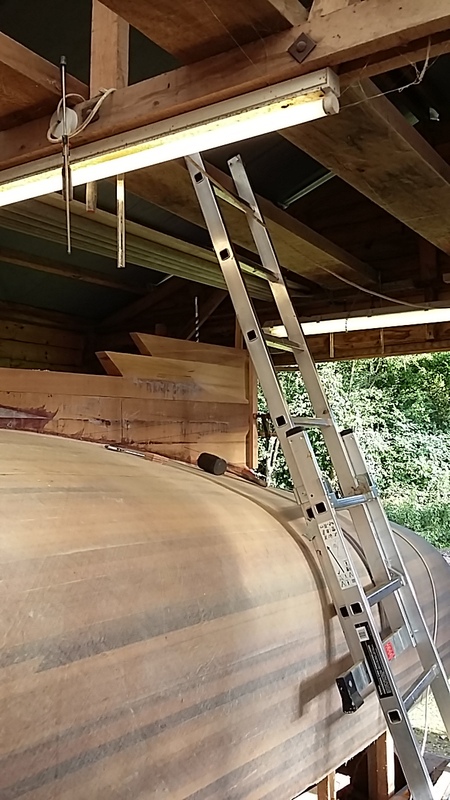 As shown here the normal assembly of clamps is used to hold the lifts together while the epoxy sets – (and you can see how the lower end of the stern tube was plugged to allow it to be filled with cooling water)…. It also transpired that the total length of stern tube needed to be 6ft, to allow the internal structures and seals to be put in place – two problems with this: 1) maximum length of stern tube for sale = 4-feet and 2) you can’t have 6-ft of unsupported propeller shaft whirling around at up to 600RPM, so a bearing needed to be inserted into this whole structure and two lengths of glass-fibre tubing needed to be joined. In the end I decided to kill N-birds with N-1 stones and purchased a “cutlass bearing” (a rubber-lined, water lubricated bronze bearing) which I epoxied into the ends of the two parts of the stern tube and used to both provide the support for the propeller shaft and to join the two parts (god-help us if it ever wears out as it is very inaccessible now!). 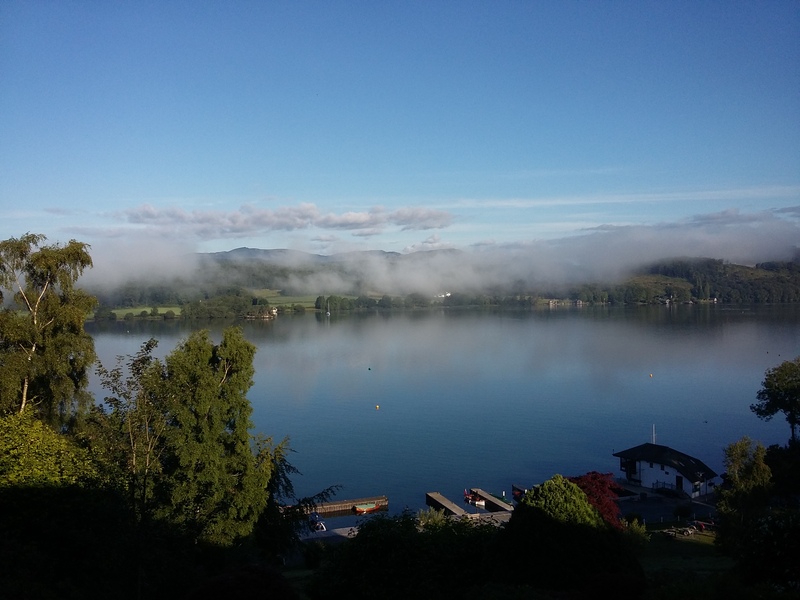 Before I continue with the tale of fitting all this let’s calm our blood by a couple of views from our hotel room at the Windermere Motor Boat Racing Club’s headquarters during the Steamboat Associations annual summer rally – believe me we needed this respite of calm for the next bit! 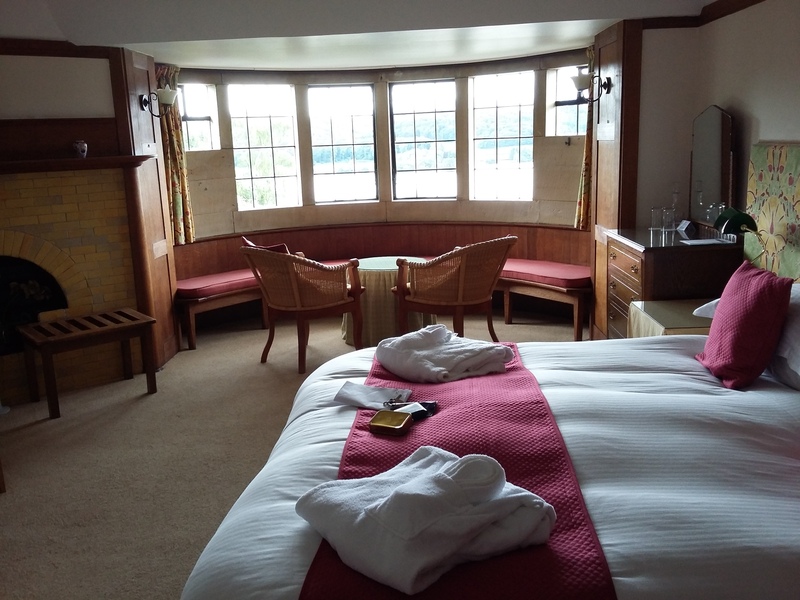 Voysey Suite at WMBRC – a very fine place for a holiday! This entry was posted in Hull Build and tagged deadwood, hull build, keel bolts, stern-gear on September 5, 2015 by sybefur.